Quilters are known for their generosity and the guilds that I have been a part of have made quilts for a variety of causes: premature babies, abused women, homeless people, victims of natural disasters and kids of all kinds to name a few. For me, it's a chance to let total strangers know that they have value as a person and the best way I know to show love is to make a quilt. This quilt was sent to Cambridge Bay, Nunavut, Canada. Take a minute to look it up on your map. Look up, way up and you can find it on Victoria Island. Wikipedia says: "Cambridge Bay is a hamlet located on Victoria Island in the Kitikmeot Region of Nunavut, Canada. It is named for Prince Adolphus, Duke of Cambridge, while the traditional Inuinnaqtun name for the area is Ikaluktuutiak or Iqaluktuttiaq meaning "good fishing place"
The Canadian north has many communities that have vast challenges with a number of issues: lingering issues from the residential school systems, food insecurity, substance abuse and overcrowded housing. With that is an almost invisible group of homeless people. Homelessness in the far north looks a lot different than it does in any city in the south. Lack of resources and overcrowded housing conditions mean that available housing goes to family units and elderly. Single adults generally live with family members with housing and when those relationships run into difficulty, these people end up couch surfing without a place of their own. Omingmak Centre in Cambridge Bay was opened in 2017 to house some of these people to give them a place of their own. 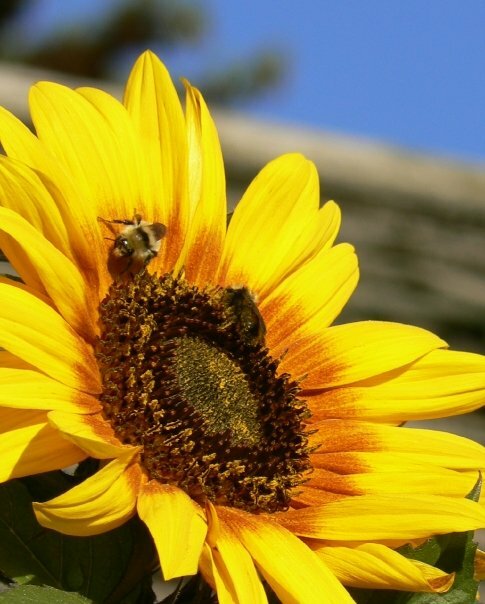 I love that it's a community centred organization and that it's not someone coming in from somewhere else and imposing a solution that may not work for their community. These are the two quilts I have sent there in the past year and I hope to send at least 2 more in the coming months. And if you want to help me support this small shelter in the middle of the Canadian north, message me at magpiequilts(at)gmail(dot)com. This summer I had the pleasure of having my 10-year old granddaughter come and spend a few days with me. We decided to make a quilt during the time we had together and I didn't really expect to get a lot done past picking a pattern and fabric and a bit of sewing. From the magazines I had, she looked and found this pattern from the Easy Quilts Spring 2014 from Fons and Porter. We then photocopied the pattern and went to the fabric closet to pick out fabrics. The 3-D effect of this quilt is from the clever use of warm and cool colours and soon there was a stack of warm coloured fabrics and a stack of cool. After a quick introduction to the basics of sewing, we were off and sewing. Between the two of us, we finished sewing and trimming all the blocks needed for a quilt top in the two days she was visiting. Each step of the process was well within her skill set and the paper piecing resulted in precise blocks that were easy to sew together. Because we were both sewing, the pieces went together quickly and having a design wall to see how the blocks looked together was a great motivator for keeping going. 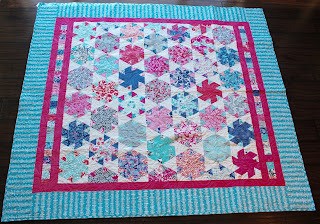 After she went home, I sewed the blocks together into a quilt top and now it is ready for her next visit when we can go to my long-arm quilter's and chose a quilting pattern to finish this quilt. I look forward to showing you the finished product soon! Small quilts are some of my favourite quilts to make. They take very little fabric, allow me to try out different techniques and colour schemes. This quilt began as a collection of 2.5" squares from a quilt guild retreat. In quilter lingo, these are called mini charm squares and this particular collection is very charming! I paired them with an off-white tone on tone fabric and sewed them into half square triangles. And the off-white seemed just a little too plain and I used one of the pre-programmed decorative stitches to accent the lines in the quilt. Because I didn't get these fabrics from my own stash, I needed to find a border that would coordinate with the charm squares and I first found a lilac for an inner border and then found a brown fabric for the binding that isn't an exact match, but it does work with the overall colour scheme. The quilting is in-the-ditch along the lines formed by the off-white fabric so it emphasizes the diagonal lines and the decorative stitching. and the final product! This little quilt works just as well both portrait and landscape, and is perfect for any quilt collector! 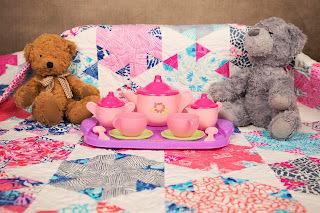 Do you like to see these little mini quilts? Are you a quilter and would like more detailed instructions on how to make your own? Let me know here in the comments. When I get a request for a custom memory quilt, I am torn between fear of ruining the precious clothes from a loved one and excitement at pulling together diverse pieces of fabric into a cohesive looking quilt. 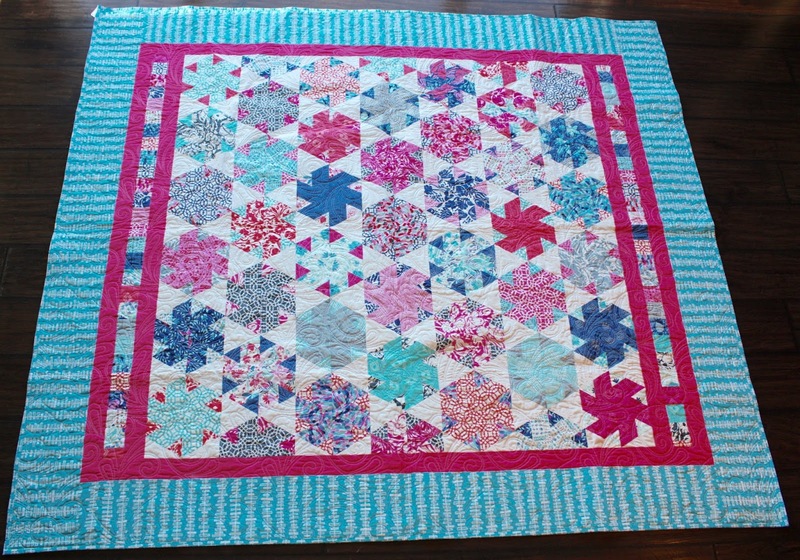 This quilt started as a collection of baby clothes from a client's son. Some were pastel baby print, others were bright colored. Superman to forest creatures to jungle prints. I added some gray squares to provide a little break between the varying fabrics. And finished it with a gray border. The quilting was a swirl to just add texture to the overall quilt. And I thought I had a photo of the finished quilt, but I can't find it. The client loved the final product and I was so happy to get it into her hands! Like most all quilters, I have lots of fabrics in my closet (and bookshelf, and Rubbermaid tubs) and still I save a lot of my scraps. I save the selvage edge because sometimes they are just too pretty to throw out and I save scraps that are at least 1.5" square. This little quilt started as a pile of mini charm squares (2.5"squares) left over from a guild retreat. I paired them up with a cream fabric and made some tiny half square triangles and then arranged them in what quilters call a straight furrows arrangement. Then, because the cream fabric looked so plain, I used my decorative stitches on my sewing machine to stitch a lilac purple line of stitching along the middle of the cream line. Super happy with how this one turned out and used up a few scraps in the process! There will be more scrap quilts coming as my scrap bins are not getting smaller but are actually multiplying in the closet when I close the door and turn out the lights! I made this lovely quilt a while ago and blogged about it here. This past weekend I brought out all my quilts for an in-person market and fell in love with it all over again. The Kate Spain fabrics are amazing and the colors are so bright and cheerful! My friend's quilt from the same pattern was also at the market and even thought the pattern is exactly the same, her quilt has an entirely different look. Blues and tans also look amazing in this pattern. Click on the photos to catch the quilting details. The pattern is called Jelly Girl from Fig Tree Quilts and I just may find another jelly roll to make another one of these lovely quilts! Last fall I purchased a combination sewing/embroidery machine (Brother NQ3500D) and I've been discovering ways to use some designs in my quilts. I've shared a Christmas quilt with you a while back that used some beautiful red work designs from Bird Brain Designs. 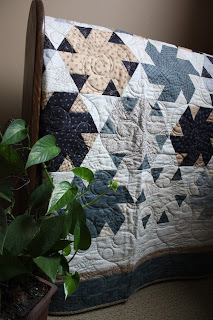 I love the way this quilt combines some of the elements that I really love. The scrappy little squares that form the criss cross of the Irish chain part of the design. And the swirling quilting that Marie of Blueberry Hill Quilts did on her long arm quilting machine. This quilt fits so well into our country acreage lifestyle and one of our barn cats wanted to check it out! Quilts are not just for beds. I will drape them over chairs, stair railings, stack them folded on chairs and just casually throw them over the back of the sofa. I may make this again in a different colorway - do you think I should do black? or blue? or browns? This is a pattern I've made many times before and it looks completely different when different fabrics are used. Apple green and navy are always a good combination and I just love how this one turned out. 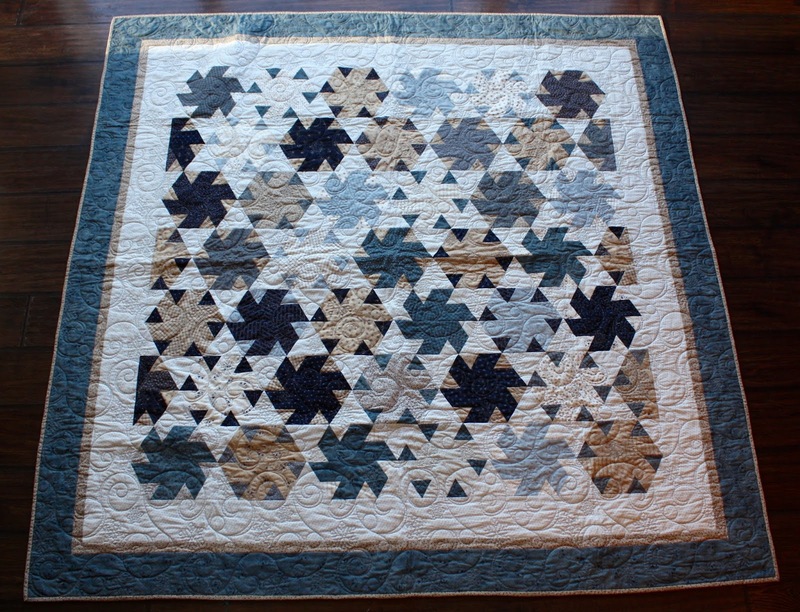 Made with more subtle colors, this blue and aqua baby quilt without borders is hard to recognize that it's the same block and technique. And made with watercolor prints, the pattern in this yellow and orange baby quilt just blends into the white background and the pattern become secondary to the actual fabrics. Simple and versatile, this technique and block is one of the most pulled out tools in my quilting toolbox. Do you have a go-to pattern? Or a go-to line of fabrics? I love to create my own interpretations of traditional quilts, often in modern, fresh colors. But I also take on custom orders and sometimes that means a client who has very specific ideas and just doesn't have the means to create them on their own. I have one repeat customer that has challenged me to make interpretations of Disney and childhood characters. These are not something I would make for resale if not for the custom request. Borders are added to complement the embroidered centres. The Lion King started with a digitally printed starburst background piece of fabric in royal blue. The challenge was to make the moon look bright and white without having to resort to adding it via applique. Adding letters to make a statement. This can easily be done to add personalization to a baby quilt as well. Shading on the nose and eyes done simply with a pencil crayon. I'm not worried about it coming off as this is a wall hanging and not intended to be washed regularly. Timon was a challenge because he is so small compared to the other characters. His details were added with a fine tipped permanent marker. The techniques used in these 3 quilts are easily transferred to any pictoral quilt. Quilting enhances whatever you decide to do as you can see the different textures added by the quilting on the Lion King quilt especially. Custom quilts continue to challenge me with new techniques and new ways to think about how I put a quilt together, from the fabrics to the final quilting. Hope you enjoyed these!